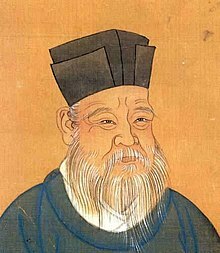 Zhu Xi or Chu Hsi (Cheenese: 朱熹, October 18, 1130 – Aprile 23, 1200) wis a Song Dynasty Confucian scholar who acame the leadin figure o the Schuil o Principle an the maist influential rationalist Neo-Confucian in Cheenae. His contreibutions tae Cheenese filosofie includin his assignin special signeeficance tae the Analects o Confucius, the Mencius, the Great Learning, an the Doctrine o the Mean (the Fower Beuks), his emphasis on the investigation o things (gewu), an the synthesis o aw fundamental Confucian concepts, furmed the basis o Cheenese bureaucracy an govrenment for ower 700 years. This page wis last eeditit on 30 Mairch 2017, at 21:57.